Caridad Galan: "I paid my time and I’m still paying." After serving her sentence she had a hard time finding work and believes Amendment Four is needed as part of a wider overhaul of the system to give greater consideration to rehabilitation. Her Colombian husband was involved in drugs and she was swept up in the case on a conspiracy charge. Sentenced to 18 years in jail, she ended up serving 10. 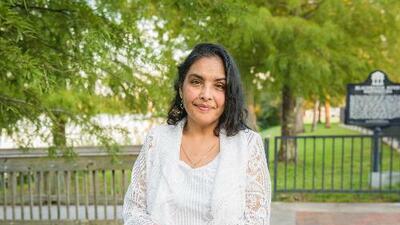 Now 53, Caridad Galán looks back on the experience as "the toughest years in my life." Released in 2000, she is now happily remarried to a Pensacola barber, with a 16 year old and a two year old adopted boy. She was sitting at her kitchen table one Sunday afternoon when a relative called and asked to meet her at a gas station. "She handed the baby to me and walked away." she said. "We had to relearn how to do the diaper thing," she laughs. "He has been a blessing, I birthed him from my soul! He is my heart beat. One does not need to bear a child to know the love for one." She has another son, Carlos, who was 16 when she was released from jail, but they are not on speaking terms. "He suffered the most. I left him at six. He has a lot of anger issues because of the choices I made. It hurts so much. There's not a moment in my day I don't think about him," she said. The daughter of a Puerto Rican mother and a Spanish father from Ceuta, the Spanish territory in North Africa, she was born in New York and raised in Tampa. After her release she struggled to find a job. "When they look into my past it’s a total waste of time," she said. Eventually she got a job with the Department of Children and Families. The application asked if she had been convicted of a crime in the last seven years, so she answered "No," and she was offered the the job. Galán was the only bilingual person in the office and everything seemed to be going well, but after three or four months she got a call one afternoon from human resources in Tallahassee. "They told me I was being fired. They kicked me out like I was a criminal, no appeal, nothing," she said. "I was destroyed. It was so painful, I felt such shame over it," she added. She gave up looking for office jobs and now works from home as an online interpreter. Her clients include prosecutors, jails, and even the FBI. She enjoys the works and it's easier with her young son. Galán believes strongly in Amendment Four as part of a greater need to overhaul the criminal justice system. "I paid my time and I’m still paying," she said. "They [state government] don’t believe in rehabilitation or renewal of the mind. Of course, not everyone comes out with a renewed mind. Others come out worse. But they make it so difficult. When they get out they can’t get a job. I think that’s why people go back to jail because they don’t get a chance. Not everyone has the strength of character and will. I have always managed to find something despite the obstacles. I have worked as a cleaner and in fast food restaurants. I did whatever I could find." She hasn't voted since 1992. "Not having a voice is horrible. It's like having a bandage over youth mouth."